Below is a guide to the services we offer. You'll also find a brief explanation of what's included and the cost of the work. These prices will vary slightly, depending on the amount of work and parts required. This is why it's best to arrange a time to come and pay us a visit (you may even be offered a cuppa), where we can discuss in detail exactly what work needs to be done and the best possible solution. 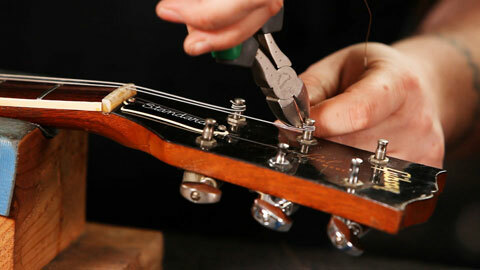 There may be instances where your guitar needs more than a standard setup. 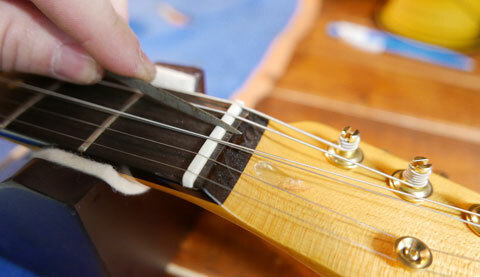 If the frets are uneven or damaged this would make a standard setup impossible to complete. 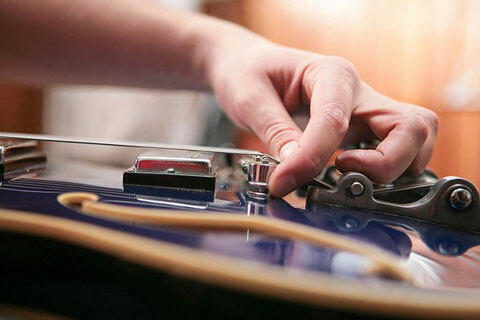 For this reason we offer a setup which includes the more advanced work needed to get your guitar playing the way it should. You guitar then gets a full setup, which includes action adjustment, intonation, nut slot height, truss rod adjustment and string replacement. 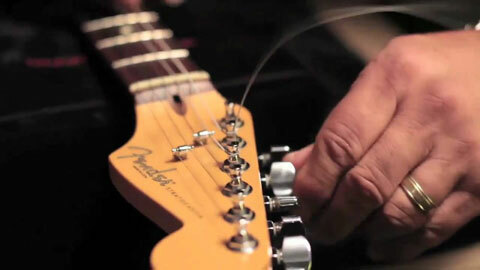 We stock a wide range of strings from major brands such as D'Addario, Ernie Ball, Elixir, Dunlop and Rotosound. 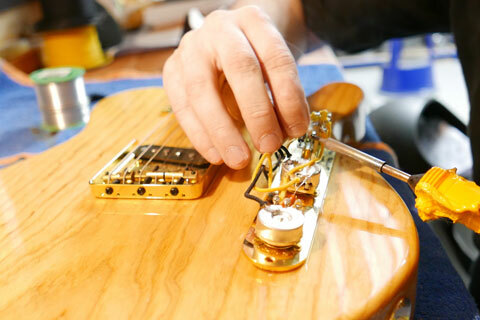 Whether you have an electric, acoustic or bass we're sure to be able to fix you up and get you playing again in super-quick time. 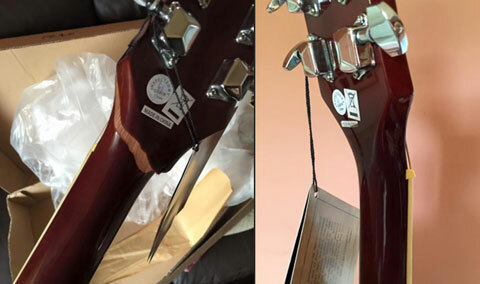 An all-too-common issue for many guitar models with angled headstocks. The cost of a complete neck replacement can mean that repair is the only option for many players in this type of situation. But it doesn't have to be "make-do" solution. Done properly, the repair will be unnoticeable, and provide the necessary strength to allow you continued use of your axe for a fraction of the cost of a brand new neck. We offer a wide variety of nut materials, including bone, graphite, and brass. We're also an authorised Graphtech dealer, supplying a large selection of their Tusq and Tusq XL synthetic ivory nuts. Whatever your guitar model, we're sure to have a nut to suit. 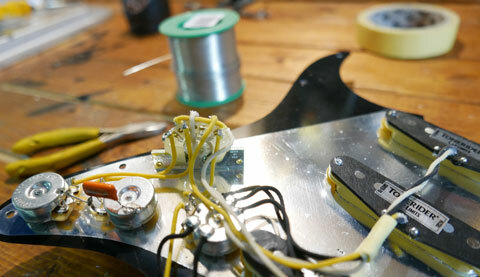 For those who aren't too handy with a soldering iron we'll happily install your own choice of pickups and have your guitar sounding sweet again. We're also an authorised dealer of Artec, Tonerider, Seymour Duncan and Bareknuckle pickups. We are authorised dealers for most of the big name manufacturers, including: Fender, Martin, Wilkinson, Sperzel, Kluson, Tonepros, CRL, Switchcraft, Dunlop, D'Addario, Rotosound, Ernie Ball and many more. Buy any hardware from us and we'll offer you a 10% discount on fitting.